Great new little restaurant right off the main drag of Petaluma Blvd., on a corner with a few parking spaces in a lot right next to the restaurant. Decor is simple but pleasant, as was the service. Came for lunch with a cousin. 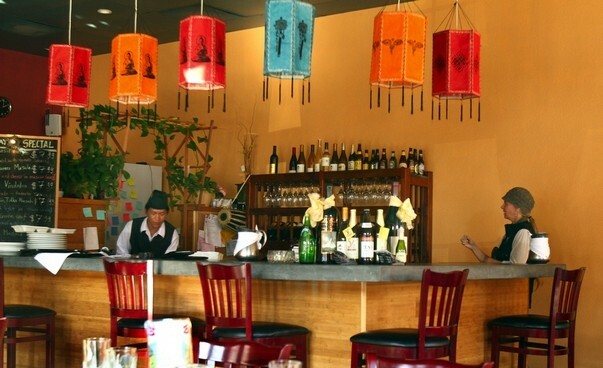 We both had read the recent Jeff Cox review in the Press Democrat, and were anxious to check out the menu and dig into some authentic Nepalese and Indian food. Personally, I love Northern Indian food. However, my favorite dish actually comes from Goa on the Southern coast of India; inspired by the Portuguese who settled there. Specifically, Vindaloo. The word comes from a combination of “Vin” meaning vinegar and “Aloo” meaning garlic in Portuguese. It is a classic Goanese dish that can be ordered as spicy as you like (mild, medium or blow your socks off hot!) with a mixture of meat or fish (without for vegetarians), potatoes, and vegetables in a wonderful sauce seasoned with garlic, ginger, and all those colorful Indian spices. We ordered a starter to share: Lamb Cholia; cubes of bar-b-qued lamb, marinated in olive oil, mixed with garlic and ginger. This dish looked fine, but the meat was not as tender as it could have been, and the sauce was a bit lacking. Hoping to strike the gold standard on the mains we planned to share, I ordered Shrimp Vindaloo on the specials board and my cuz chose Chicken Tikka Masala; boneless chicken from a clay tandoori oven cooked in light cream, cashew nuts, fresh tomato-onion sauce, garlic, ginger and spices. Lunch and dinner a la carte entrees come with house made Naan bread and brown or white rice. The Shrimp Vindaloo (medium spicy) was excellent. The Chicken Tikka Masala was less impressive with a sauce that was dense and heavy. We both agreed, the Vindaloo dish was the clear winner with a sauce fit to dip your Naan into. Also noteworthy was the hot Spiced Chai Tea with milk, and the brown rice was delightfully nutty. With nine vegetarian curries to choose from this place should do well with the veggie crowd too! Worth checking this place out.